The Best Choice For Your Little One! After becoming a mother,your life becomes a busy and trivial,hope you use our products,you can take care of the baby,while take more personal space,life more colorful,this is our for the expression of love. Srotek bases on the cutting-edge of baby product. We are professional on design and production of baby supplies,to make our lives more convenient, more efficient, to provide customers with high quality high performance products.We make every effort to achieve the best in every detail of design, material, sales and aftermarket. 1.Design for all baby,can be folded,easy to carry,patent authentication,L type bracket, small volume,light weight. 2.Adopt science 0-180 degree free adjustment,in line with the development rule of the baby,according to adult and infant's body,adjust every proper posture. Profession design ergonomic baby carrier,provide safe and comfortable carrier experience when you outdoor with your baby. Made of high quality soft/breatheable polyester and mesh,lightweight and durable,lessen strain and fatigue for the parent throughout long carriages. Adjust bucket seat supports your baby in an ergonomic natural position.extra wide wraparound waistband connect with velcro and heavy duty buckle,provide double safe. Removeable Epp board attaches to the carrier with velcro and zipper,detachable hood protects baby from sun light and wind.front pocket fit for baby pacifier/tissue etc. 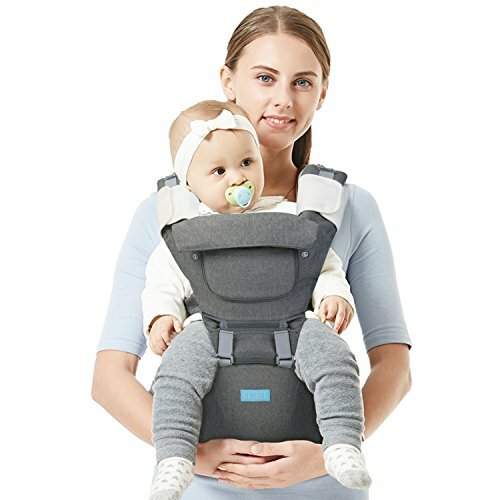 This simple baby carrier easy to put you baby in or take baby out.you can just do it only yourself,it is a stress-free one-person job.